Akita Dogs - The Akita originated in Japan. This breed, unchanged for centuries, is considered the national dog of Japan. They were highly prized, revered, and only owned by nobility and aristocracy. They were used in various capacities such as Imperial guards, hunters of bear and boar, and retrieving of waterfowl. They are the largest of the Spitz-type breeds. Today, the Akita is a faithful companion, therapy dog, and guard dog. 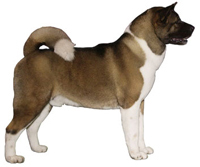 Akita Breeders - Advertise your kennel puppies and dogs here.